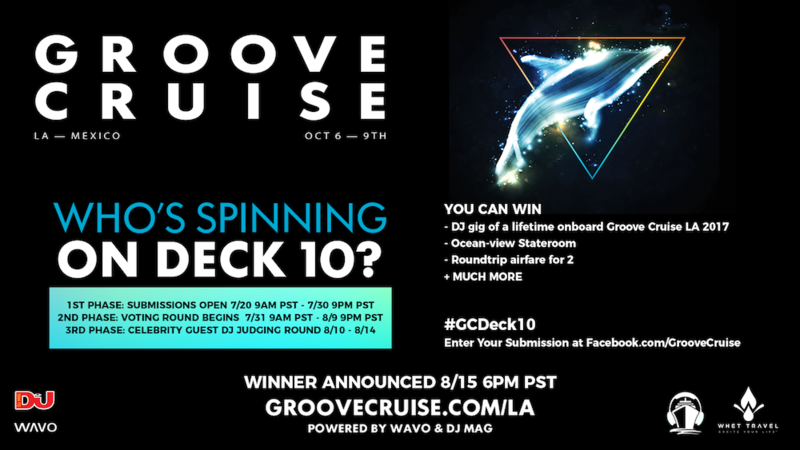 Groove Cruise 2017 announces DJ competition! Groove Cruise 2017 sets sail from LA to Mexico from 6th to 9th October, and you could be in with a chance of DJing onboard! The floating festival's Who's Spinning On Deck 10? competition offers the DJing gig of a lifetime, with the prize including a set at the festival, an ocean-view stateroom to stay in, and round-trip airfare for two people. Plus the winning mix will featured on an upcoming episode of the Groove Cruise Radio Podcast, which goes out to over 100,000 subscribers on iTunes, has been listed as ‘New & Noteworthy’ as well as entered the Top 100 Music Podcasts in iTunes. The competition opens today (20th July) and closes 30th July, with a round of voting from 31st July to 9th August, following by a celebrity guest DJ judging round from 10th to 14th August. The winner will be announced 15th August at 6pm PST. To enter, just submit a 60 minute mix to the WAVO website. Getting your track to the top of the chart will increase exposure and consideration, but the winner will ultimately be chosen by the judging panel based on votes, creativity, and quality, regardless of its ranking. Use the hashtag #GCDECK10 to promote your mix online. Groove Cruise 2017 boasts a massive line-up of top acts, including Ferry Corsten, Green Velvet, Andrew Bayer, Thomas Jack, 3LAU, Arty, Billy Kenny, Autograf and many, many more, so don't miss your chance to play the same amazing fest as these greats. For more information head to the Groove Cruise website.